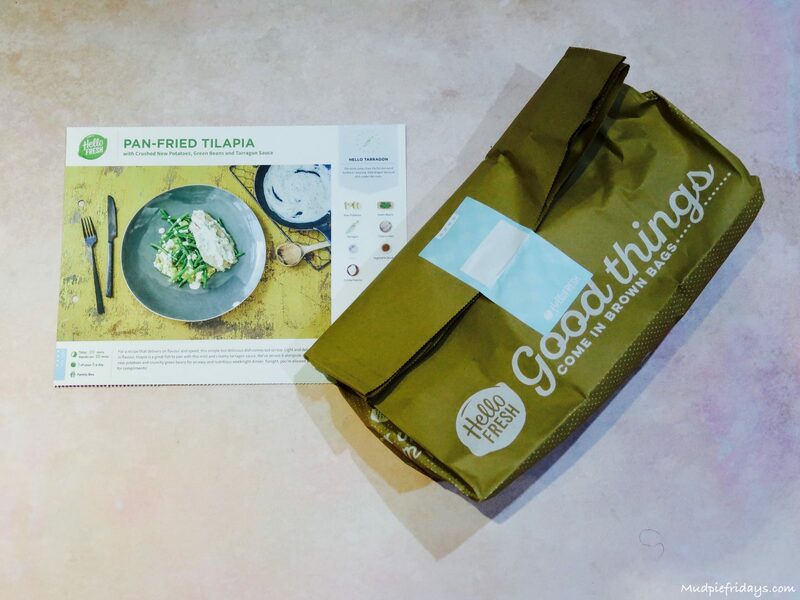 HelloFresh – Where have you been all my life? 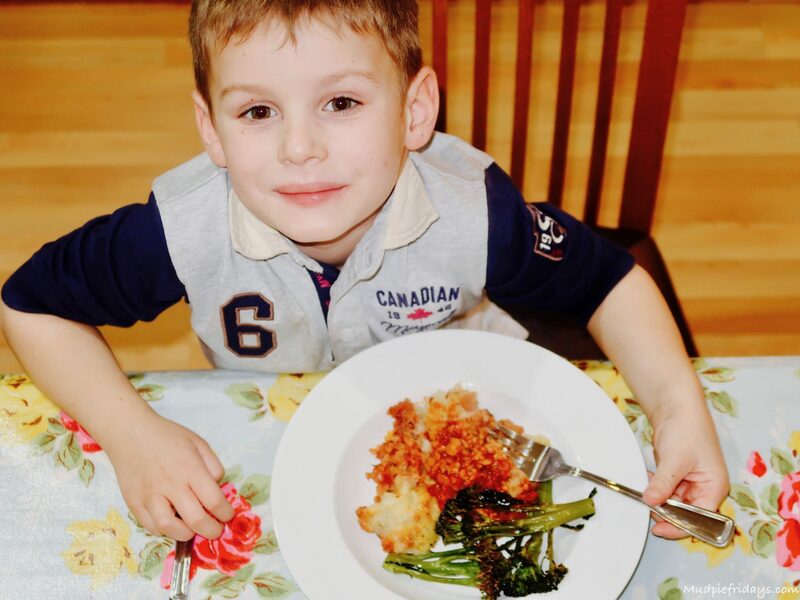 HelloFresh Review: We all know that parenthood can be a bit of a juggling act. Especially when you throw work into the mix as well. Hubby and I often find ourselves doing everything on the spur of the moment. Which also includes food shopping and discussion around what we are going to have for dinner. Which usually only occurs to either one of us on the way home from work or on the way to pick the kids up from childcare. That normally results in one of us making a quick dash to the shops grumbling about the fact the other party should have thought about it and done it before now! Sound familiar? So when HelloFresh contacted us with the launch of their new Family Box I was intrigued to see if this could be the answer to our needs. If you have not come across Hello Fresh before they are a meal delivery service with a difference. Their aim is to provide 2,3 or 4 complete meals each week with all the ingredients already measured out for your to cook at home. Their new family friendly box promises to ensure that you all get the correct balance of veg, protein and carbohydrate in each meal. For the last month we have been trying out their Family Box with four meals each week. This is just the right size for us as it enables us to know we have dinner from Monday-Thursday. As I don’t work on a Friday I can then ensure the rest of the week is taken care of. Its been lovely not having to worry about needing to buy anything on the way home from work. Or any discussion around meal planning. Instead all we need to do is decide which recipe we are going to try out. So what do you get in the box? Each Monday we received a box with four individually packed brown paper bags each with a colour coded sticker. There is also a large ‘fluffy’ bag with a plastic layer, which has all the cold bits in it. 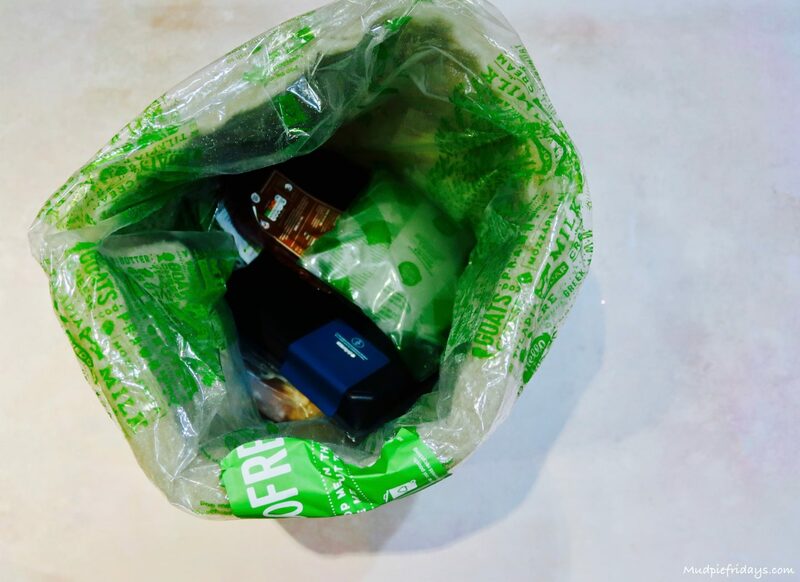 The fluffy bag can be recycled or sent back to Hello Fresh for them to reuse. The fluffiness of the bag means thats its insulted to ensure the food is as cold as possible. Also in the bag are large blocks of ice, the sort you could build an igloo with! In fact the boys have enjoyed some sensory play with them. There are also four recipe cards which correspond with the coloured stickers on the bags. Each recipe card has an inspiring picture on the front of how the meal should look, plus a list of ingredients. On the other side are the step by step instructions in pictorial form. They are really easy to follow. 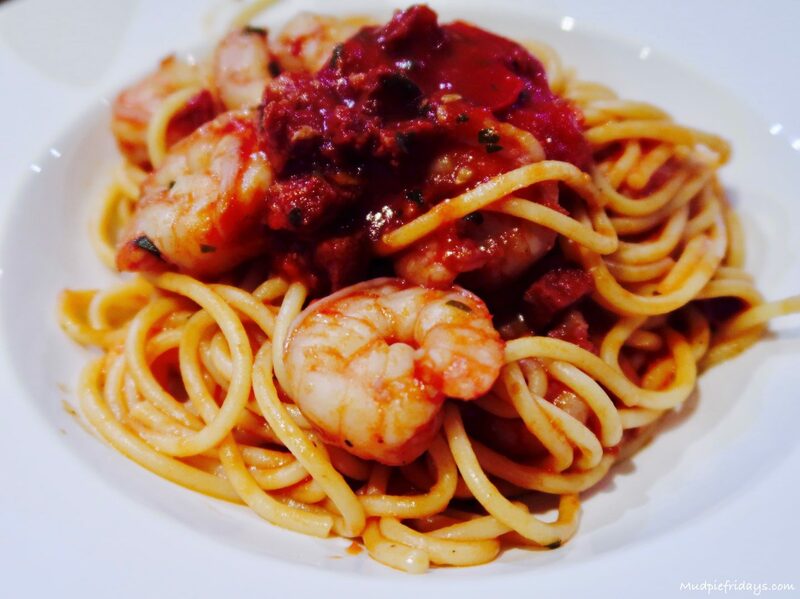 We were impressed by the variety of the meals each week, although because we opted out of fish they tended to include a sausage and pasta dish and a chicken dish each week. Still over five weeks we did not have one that was repeated. Price wise I think the meals are probably on par with what you can buy in the supermarket. For £63 we had four meals which served four. In most instances there was more than enough food and we ended up with extra portions which could be frozen. That equates to just over £15 a meal. The saving we made by not going to the supermarket, petrol, parking fees and not being tempted by offers, more than made up for any differential in price. The only thing I would say is that although all the recipes come with a timeframe on the cards, we didn’t manage to stick to one… ever. All the recipes took longer and we think this is because we are not trailing them in an industrial kitchen. So we don’t have the page pans etc so it physically takes longer to cook. We even tested it making sure we prepped everything in advance. Ingredients were good quality in the main. We did have some peas that were a little fermented but from our experience thats a rarity rather than the norm. It certainly would not stop us signing up. We got to try out some new recipes and since they each come with a card it means we can use them again and again. I discovered some new ingredients, when I have traditionally made sticky rice I have always used coconut milk. The HelloFresh recipes used coconut powder which made the most delicious coconut rice I have ever had. Better than our favourite this takeaway! 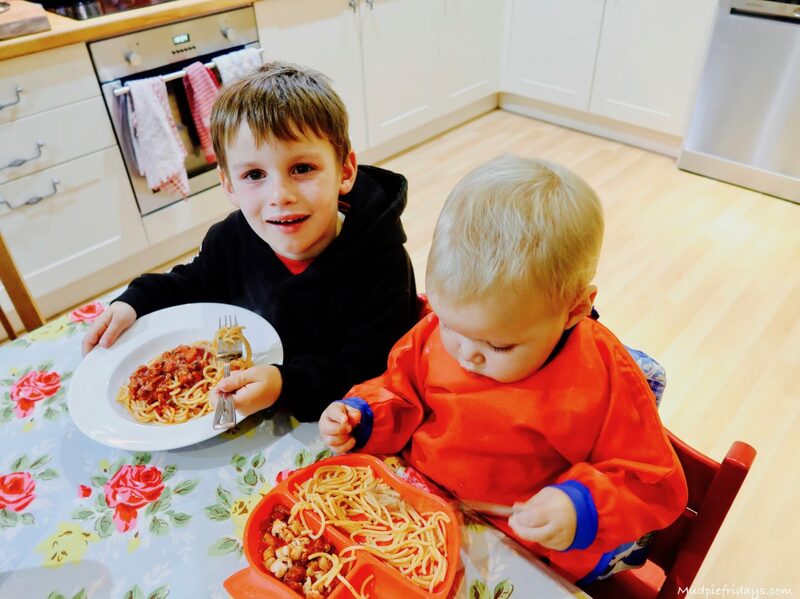 The meal portions are designed for a family of four, Monkey is 5 and Kipper is 18months which meant that we got a lot of left overs… perfect for lunch the next day! I think this is mainly due to the age of the kids, although they are over generous with some dishes especially the pasta ones. They have one eye on the environment all the packaging is recyclable and we have even used the ice blocks for sensory play. Out of the five boxes we had which is twenty meals! There was only ever one which was missing something and it was a perishable – corn on the cob. I think it is good that they didn’t send something substandard. Instead they credited my account with £10 and emailed in advance to let me know. To be fair I couldn’t ask for more. Life as a busy family where both parents work, and have a business on the side can be a juggling act. By having our meals for the working week delivered it really made a difference to us and its something we are going to continue with. 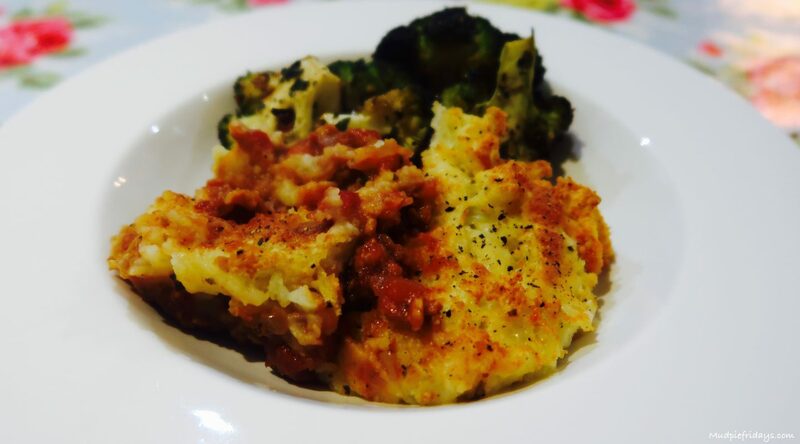 This is a collaborative post and has been written in conjunction with HelloFresh. We were sent some of their family boxes for the purpose of this review and I was compensated for my time. All words and opinions are my own. 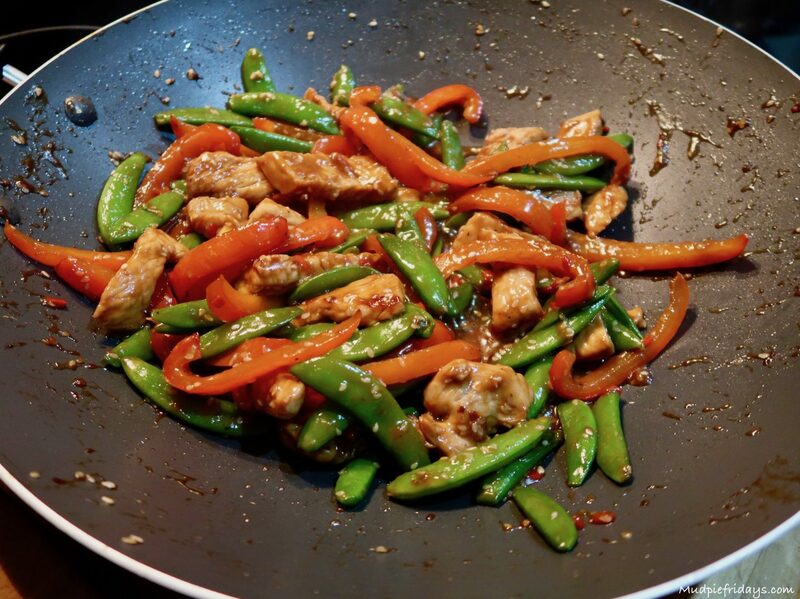 I love the idea of Hello Fresh, especially for something that all the family can enjoy. I especially love the idea of shopping less, and not being tempted by offers in the supermarket! I usually spend less when I shop online for food and don’t visit the supermarket. Your little ones look like they’re enjoying the food! Have always fancied trying this out for our family so interested to hear how you got on. These look good. The price puts me off, as I can shop for a family of four for all meals for a whole week for roughly the same, but it might be something worth trying as a treat. Some of those recipes look great but are ones I perhaps wouldn’t try on my own – the coconut rice sounds lush. I’m glad you had a good experience with them. I was sent off, nasty chicken and they did nothing about it. 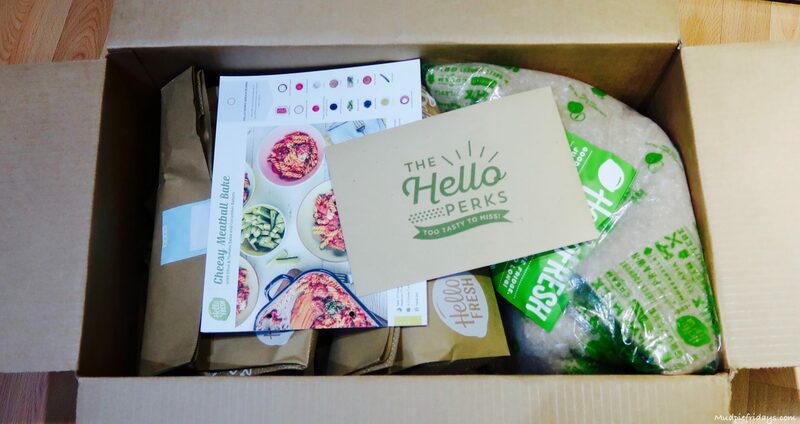 I have read lots of great reviews of Hello Fresh but have yet to try them myself – they would be great for new mums and dads, especially, who have little time on their hands to shop for meals! Ooh this was interesting. They always come to our door to try to sell it to us! Helpful review thanks. I think it’s a great idea and I’d like to try the cumin roast chicken. I really need to try this. There is so much unintentional food waste at our house. A lot of it is to do with the fact that I don’t plan ahead when I do the shopping and am often stuck for ideas. Really really love the idea of this/these recipe boxes, my only down point would be cost… but, there are a lot of cons, time saving, and helping you to discover together. These look very convenient but I’m very worried about the environmental impact of all that packaging, especially as so much of it is non recyclable. There seem to be a lot of tiny packages of things you would normally buy in a single, larger pack. And that means much more waste per total amount of product. I’m surprised these boxes have caught on at a time when we are meant to be reducing our packaging waste. I have been meaning to try recipe boxes for some time. The problem with baking from scratch at home using my own recipes is the number of products left in the cupboard for months and years afterwards from which only a teaspoon or tablespoon has been used. Although Hello Fresh and similar boxes seem expensive, at least there is no waste. I love the idea of this and I shall definitely look into it now that you have promoted it so well. Thank you. I hate shopping and as you say you do get tempted to buy extra things when out because they are on offer. I even get offered things and am being told my offer is incomplete when shopping online which soon adds up to a lot more than you would usually spend. HelloFresh sounds like a great idea and I will definitley be looking into incorporating it into our mealtimes. I like this idea of not having to think up meals every day, it would make life so much easier but the price is definitely too high for me. 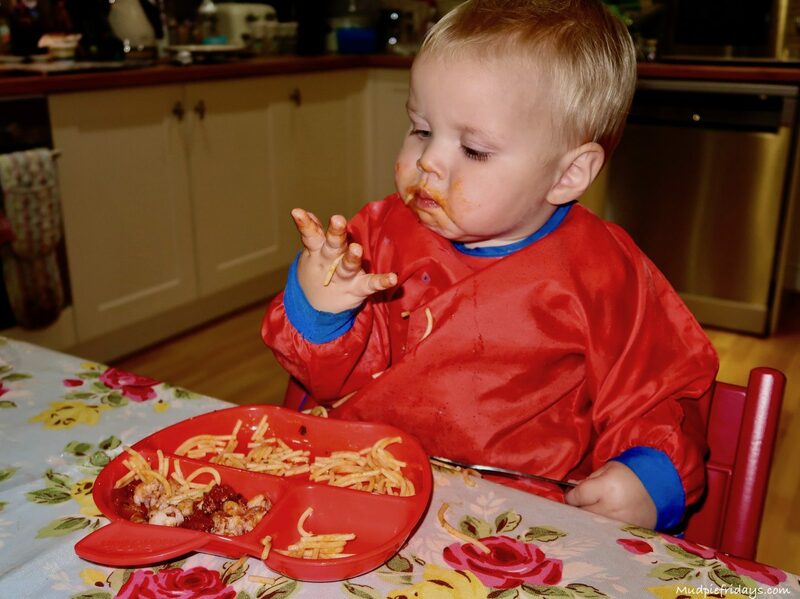 Kids seem to always love spaghetti – I wonder why? This looks so yummy very worth it . This is perfect for an idiot in the kitchen like me!! I need step by step instructions! 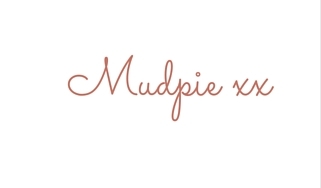 I have seen this service so many times on other bloggers sites and would love if this exists in Ireland. This would help so much to cook a meal from scratch so easy. I’ve seen adverts for Go Fresh, but wasn’t sure it would be value for money, but after reading this I might try it myself. Those meals you made look really nice! These look amazing! just what we could do with.